Just like a magnet, Crystals have the ability to absorb, remove, balance, and push energy. Negative or Positive. 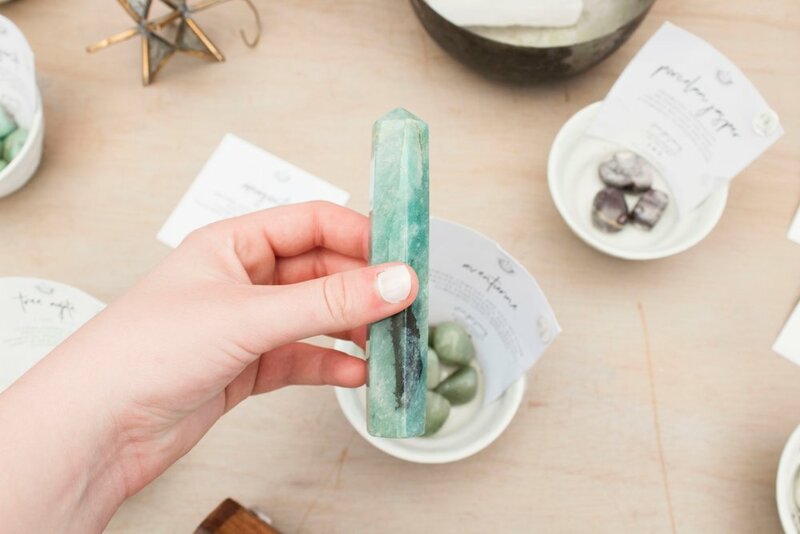 Because of this Crystal healing can be a helpful meditative aid as you begin to really focus on manifesting a life for yourself or reaching new goals. However, There are hundreds of crystals and it can be overwhelming to figure out where to start. You can certainly research all the available crystals and the different healing properties each of them provide, however, stick to three or four when starting out. Having a multitude of crystals can make a lot happen at once so make sure to pace yourself! Keep in mind the crystals do not have magic powers. Owning them will not make things suddenly appear. They simply enhance the energy and actions you have already put forth in the world. You must still work through your own journey and crystals are a great companion to help you along the way. When choosing crystals choose ones that resonate with you the most and reflect where you are in your life at this moment. There are an abundance of healing properties to help you along your journey. Known as the “Master Healer,” the cleansing and absorbent properties of this stone make it perfect for meditation or healing for every level. Clear Quartz resonates with higher chakras which means higher focus, balance, clarity, and higher consciousness. However, be sure to cleanse them frequently because of the high absorbency of this stone. Known as the Purpose Stone, the Amethyst vibrates at a higher frequency and resonates with the Third Eye Chakra (Ajna) responsible for opening divine consciousness and higher intuition. This stone can aid in getting rid of disruptive behaviors and mood swings. Providing clarity when there's confusion in the mind and protection on the road. These crystals help ground us in the earth. Showing us the path to clear the way for new possibilities. Great for those that want to invite more abundance and attract new opportunities. Personal power and prosperity can be powered through this stone. Citrine also helps to remove financial blockages and negative energies, making it a great aura of protection. Aventurine can come in a variety of colors! However, Green Aventurine is known as the stone of luck. A good choice for those that want to tip the scales of good fortune in their favor. This stone helps to empower self esteem, personal growth, heart-related ailments, emotional issues, and even relationships. Some say it can bring new opportunities suddenly and even help with physical ailments such as allergies or sleep disorders. One of the best stones to use for relationship troubles, emotional traumas, and other emotional issues. Rose Quartz symoolizes love, peace, and harmony. It can encourage forgiveness and compassion for yourself and others, open the heart to give and receive love, and even deflect anger. Its soothing and calming effects will foster peace and tranquility. A strong and resilient stone, Black Tourmaline protects us by repelling negative energy. They can help deflect the harmful intentions of others or create an aura of protection around the home. Black crystals can also protect from EMF frequencies from electronic devices. Even better, placing the stone over a piece of paper detailed with your intentions can remove psychic blockages that you have a hard time manifesting. Creating positive energy and abundance in its place. Setting intentions with crystals are a great way to add power to your manifestations. Start by holding the cleansed crystal in your dominant hand. Clearing your mind of any negativity. Visualize a white light within your crystal. Next set your intention. For example, if I was holding a rose quartz stone, I would think, “Please grant me the compassion and love I need to open my heart to others.” Repeat as necessary until you feel the intention has been set. Recharge them in the sun as you see fit. Meditating with stones are also beneficial. Healing stones and crystals are a part of ancient history and therefore harness millions of years worth of information. Sitting still and meditating with a stone in hand during the process can provide life-changing insights or breakthroughs. The laying of stones is a direct application of energy to the body. As the name suggest, placing certain stones on specific body parts would help to balance or absorb certain properties. Just like taking a Tylenol for a headache, you could also sit quietly with a quartz crystal on the spot of your pain. You can also move them around the body. Try a healing crystal “wand” to clear negative energy fields. You can do this head to toe up to three feet around you. It never hurts to work on your entire aura! You can also wear them as jewelry or in your pocket to balance or protect your energy levels throughout the day. Almost like a daily vitamin. Placing crystals around the home, work, or car can add extra protection or power as well. For example placing rose quartz in the bedroom can draw in romantic energy or placing black tourmaline around the windows can help repel negative energies from the home. Placing them under a pillow or nightstand can offer peace of mind by eliminating any doubts or fears before bed and while sleeping. Freeing our subconscious minds to heal and learn at an accelerated pace. Switching stones out of your bag or work spaces is encouraged as we are seeking different things at different times. Because your crystals absorb so much energy it is important to cleanse them. You should cleanse them before each use and anytime you use them to absorb negative energy especially. This can be done simply in many ways. Crystals can be soaked in purified water, salt water or holy water (although, be careful not to use amber, turquoise, red coral, fire opal, moonstones, or stones that end in “ite” as they will dissolve). Setting your stones under the light of the full moon is also an easy way to bathe your crystals. Smoke from burning sage purifies stones directly as well. Lastly, burying them in dirt for a week can recharge your crystals to the vibration of the earth. This should be done after each use and eat healing session. Once cleansed, reset any intentions after aligning them with your energy. This can be done by holding them in the palm of your hand, with eyes close, and thanking them for the healing they have provided.